This is the story of the Ford family: Barbara Dunmore, William Ford and their three children and how their lives were shaped by the enduring shadow of race in America. In April 1992, on Long Island NY, William Jr., the Ford’s eldest child, a black 24 year-old teacher, was killed by Mark Reilly, a white 19-year-old mechanic. Although Ford was unarmed, he became the prime suspect in his own murder. I defy anyone not to be gripped by Yance Ford’s documentary. Within minutes, I certainly was. While films exploring racism and injustice are (sadly) no longer rare, this feels different. Strong Island’s raw emotional intensity (driven by Ford’s uncompromising to camera interviews) is incredibly powerful, thought-provoking and deeply moving. The tragedy is hinted at from the start. There is mention of an injustice, of a lack of resolution, of a heartbreak that has torn the Ford family apart. We are then taken back in time as Ford’s mother, Barbara Dunmore (a fascinating, eloquent and engaging storyteller), shares the family’s history. The tale starts with Yance’s grandfather and another tragic death. No matter how many tales we hear about the evils of segregation, they feel no less shocking. Even more distressing is the parallel (again involving racism and injustice) between this story and the death of Ford’s brother William. In linking what happened to his grandfather and his brother, Ford questions how far we have come in the fight against discrimination. Strong Island reminds us that, in certain sections of society, some lives appear to matter more than others. Strong Island explores significant societal issues while still managing to be a deeply personal and intimate story of one family’s tragedy. Before we find out what happened to William, we learn about the Ford family. We hear how Barbara and William met, about their love for their three children and how they lived their lives. Meanwhile, Ford reveals his own struggle with his sexuality (he is transgender). Each story is brought to life via a collection of family photographs - a powerful technique that draws us in, forging a deep connection between us and the Ford family. As a result, when Yance Ford reveals the details of his brother’s murder, it feels truly devastating. The director describes William’s death not as the end but “the beginning”. It is the start of the family’s fight for justice and also the start of an almost unbearable journey. Here Strong Island becomes an incredibly powerful examination of grief and loss - a look at the impact this bereavement has had on each family member. It is deeply moving to watch as Barbara, Yance and his sister, Lauren, speak about their heartbreak and their guilt. Each one believes they could have done something (or not done something) that could have made a crucial difference. Strong Island is a film about racism and injustice, grief and loss, guilt and anger. However, this documentary is also about a young life cut short. All too often in films involving tragedy (and particularly murder) the focus is on the killer. Who was he/she? Why did they do it? What happened to them afterwards? However, Ford has no interest in William’s killer. He is allowed only the briefest of mentions and, in a film full of photographs, we do not see a picture of him. While Ford’s admission that he sometimes views Mark Reilly as every white man that he sees is desperately sad, it also serves to remind us that his grief is still so raw. At the end of Strong Island, Ford asks us if we know her brother. The truth is that a documentary - even one as powerful as this - cannot enable us to truly know a person. However, thanks to this film, William Ford Jr. is no forgotten victim, he is no longer just a upsetting statistic. Ford brings his brother to life via photographs, family anecdotes and by reading extracts from his diary. She reveals a thoughtful and deeply poetic man with hopes and dreams and so much potential. The US legal system undoubtedly failed William - but his family did not. Yance Ford’s film certainly does justice to his memory. You can watch Strong Island on Netflix. Have you seen Strong Island? 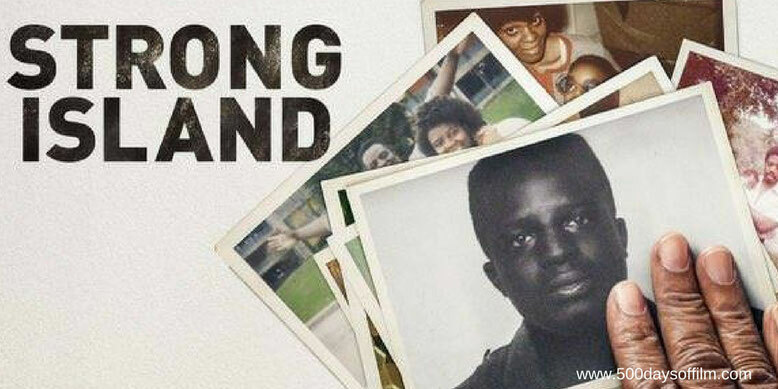 If you have, what did you think of Yance Ford’s film? Let me know in the comments section below or over on Facebook or Twitter (@500DaysOfFilm).